Over the past couple years I keep coming across sites for CNC machines (computer numerical control). In short, it is a machine that can take coordinates from a computer and do "something" at those coordinates. Some cnc machines use a laser to cut out exact shapes from materials, some cnc machines can etch out a pc board for circuits, and some can even create 3d objects. I've always thought about how much I might be able to use one, but as the commercial models are $5k-$30k they've definitely been out of my grasp. Though my desire for a personal cnc machine was solidified at Messiah College when I used one to etch out circuits for my senior project. It was the coolest thing ever. I designed the circuit in Multisim, transferred it to Ultiboard to lay out the physical components, and then took the pattern to the cnc. There Steve would help me throw in a bit of copper plated pcb and pop in a bit and watch it go to town. The machine would drill the holes for the through hole components, and then take off a thin layer of copper to form the traces. When it was done, I had a custom board that I could solder my parts to. Talk about rapid prototyping! When I found a collaborative project entitled, "RepRap" (the Replicating Rapid-prototyper, reprap.org) that claimed to have plans to build self replicating cnc machines I was intrigued. Over the next few weeks I poked and prodded the site to see if the instructions were easy enough to follow, that the idea was solid enough to invest time and money in. The more I read, the more excited I got. Here was a community born out of a man's (Adrian Bowyer) 2005 conceptual paper to design a robot that could produce its own parts. Now I know what I thought when I heard that, "how can a robot build itself?" Well as of right now it can't. But a reprap is essentially a cnc machine that can "print" out about 60% of the components needed to build another reprap. It does this with what is essentially a glorified glue gun called a, "thermoplastic extruder." The reprap will build a part by laying down layers of molten plastic until a 3d part takes shape. 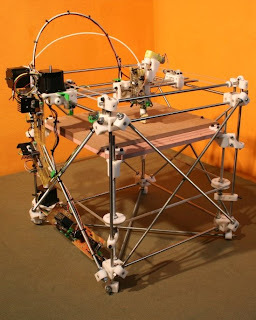 Since this RepRap is an ongoing collaborative effort by several diy'ers around the web, it is quite constantly changing. The goal of the project is to have everyone who wants to, have a rapid 3d printer sitting on their desk. I'd like to help out their effort, and in doing so create a bleeding edge piece of technology myself. And that is my 2009 new years resolution. I am SO glad you are making this blog.